If you read The King’s Speech you are already fully aware that I loved it and already see Oscar nominations in its future. 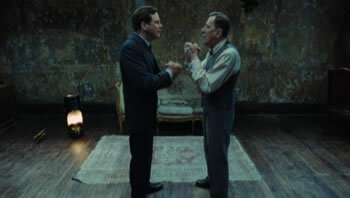 Starring Colin Firth and Geoffrey Rush, the film centers on King George VI and his speech therapist Lionel Logue as the two work to correct George’s stammer leading up to his speech declaring war against Germany. The clip featured below is something of a montage of the eccentric exercises Logue uses with George and unfortunately it doesn’t give you a feel for the friendship the two men share as the film moves on, but it does give you an idea for the light-hearted nature of some scenes. The King’s Speech is currently set to hit theaters on November 24 from the Weinstein Co. and I would expect we’ll be seeing a trailer shortly enough with quotes from the myriad of positive reviews being written out of both Telluride and Toronto. Watch the clip directly below and you can click here for my full “A” review. Based on the true story of the Queen of England’s father and his remarkable friendship with maverick Australian speech therapist Lionel Logue The King’s Speech stars Academy Award nominee Colin Firth (A Single Man) as King George VI, who unexpectedly becomes King when his brother Edward abdicates the throne. Academy Award Winner Geoffrey Rush (Shine) stars as Logue, the man who helps the King find a voice with which to lead the nation into war. The multi-award-winning cast includes Helena Bonham Carter as Queen Elizabeth the Queen Mother, Guy Pearce, Derek Jacobi, Timothy Spall and Michael Gambon.